New member, glad to be here. These are my two most recent builds. They are nothing fancy but I’m quite proud of them. I plan on building several more. I’ll stop when they make me stop (good luck with that). There’s nothing like building a rifle from a bunch of random parts. No it’s not real difficult but at the same time, not everybody can do it. Hope to get some good ideas and learn a lot here. I think my next build is going to be a 7.5” 9mm pistol or a 10.5” 300 blk. I haven’t made up my mind yet. I’m actually gonna take the pistol in the pics and put a CMMG .22 conversion in it so I can make it bufferless. Once bufferless 5.56 bcg’s get a little cheaper I’ll get one and put it back to a 5.56. It’s just gonna be a little plinker I can shoot around the house and teach my kids to shoot with. I’ve always wanted a bufferless AR. I really like how it turned out. 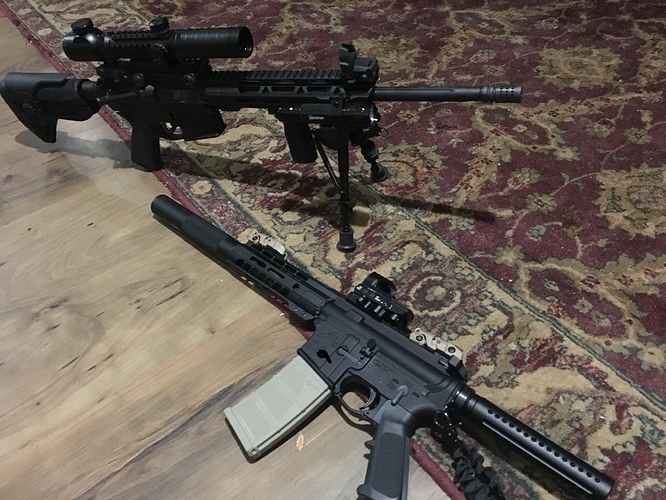 I like the one on bottom, what barrel length are you running? It’s got a 7.5” barrel on it. Both fine looking builds. Good work and welcome!